Pair of stylish deco style bamboo and caned vintage bar stools. Bent Bamboo frames and a caned seat. Stylish and comfortable ficks reed bamboo with pewter finish accented details. 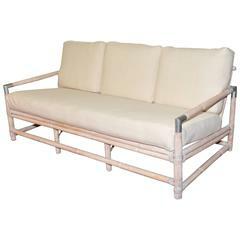 Great as patio, porch or family room sofa covered in natural canvas. Pair of bamboo stools in the manner of Franco Albini, each one of bamboo, rattan, willow and reed. Great even color, sturdy stools.